Travel Dubai in Luxury. Visit grand Burj Khalifa or the breathtaking Palm Islands. Enjoy Dhow Cruise, International Buffet Dinner, Dubai City Tour, Desert Safari, Ferrari World and Abu Dhabi City Tour. 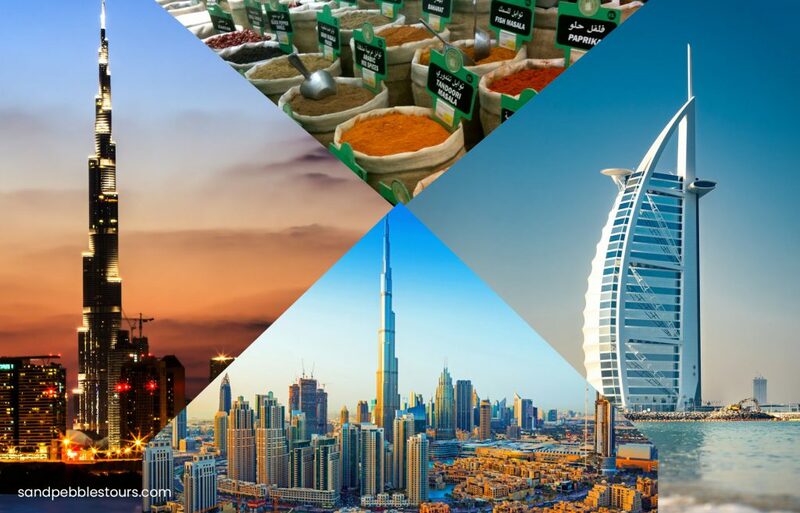 Book your Dubai Tour package on Sandpebble Tours & Travels. Lokacin da kake zuwa filin jirgin saman Dubai, za a kai ku zuwa otel din ta wakilinmu. Budewa a hotel din, shakatawa kuma ku ciyar da sauran lokutan a lokacin hutu. Ku fita daga otel din da yamma kuma ku duba malls. Idan kana so kyakkyawar kwarewa ta Emirati, ziyarci ɗaya daga cikin mutane masu yawa na Bur Dubai. Har ila yau a nan kusa ne Bastakia Quarter na tarihi wanda yake shahara ga gidajen gargajiya da aka gina da kuma hasumiyoyin iska. After a filling breakfast, you will embark on a half-day tour of the city. The tour takes you to the Bur Dubai Creek, Spice market. You can stop for a photo-Stop with the Burj al-Arab, the world’s only 7-star hotel. From here you head off to the man-made Palm Island and its crowning glory, the Atlantis the Palm Hotel. The high point of the tour is definitely the spotlessly white Jumeirah Mosque. Please note that you should not wear shorts, back and arms should be covered and women need to cover their heads with a headscarf. In this tour, you will also visit old Arabian houses with their traditional architecture. In the evening you will proceed for a Dhow cruise on the Dubai Creek. Dhows are traditional Arabic sailboats that have remained virtually unchanged for centuries. The cruise offers a very different sight of Dubai. On one side is Deira, which was, for all practical purposes, the entire city of Dubai till the 1990s. On the other side is modern Dubai with its wide roads and ultra-tall skyscrapers. Dinner (buffet) will be on board the show. Ka yi karin kumallo mai dadi da za ka iya shakatawa a otel dinka kamar yadda kuke da safe. Yau, bayan karin kumallo, kuna da sauran rana a lokacin hutu. Overnight at the hotel . Bayan karin kumallo, duba daga hotel din. Za a sauke ku zuwa filin jirgin sama don shiga jirgin ku koma gida.